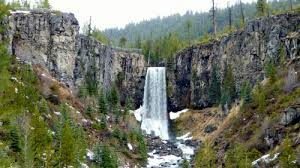 Tumalo Falls is a Central Oregon hikes that is family friendly. There are a handful of trails. One leads you to a beautiful lookout where you get a great view of the waterfall. Another trail take you above the waterfall, so you can look right over where the water starts falling! Incredible. My personal favorite trail is the one that takes you under the waterfall. You read that right…. this trail brings you right to the waterfall and you can walk behind it! You definitely will not leave this trail dry – get anywhere near the water and you will get soaking wet. Totally worth it! 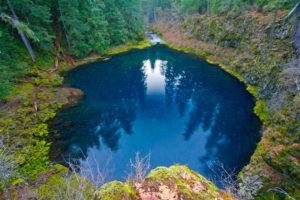 Blue Pool is a hidden gem between Bend, OR and Eugene, OR. This is a hidden lake in the woods, and the water is COLD. It is a local dare to jump in the water… many people are too scared to because it’s so cold. If you want to jump in, I recommend you don’t feel the water first, because it will probably discourage you to jump all the way in! I would like to go back on a hot summer day where I will actually have the guts to jump in – I just couldn’t being myself to do it this time. Not only is the water cold, but it is the most pure blue color! So beautiful. 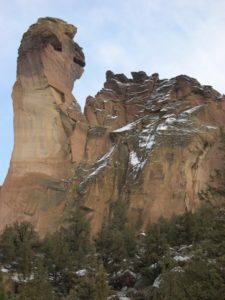 I recommend checking it out if you ever find yourself in the Central Oregon area. That’s all I have for you this time! There are endless hikes in Central Oregon – you may need a whole lifetime spent there to see all the beauty it has to offer!